Time is something I've never been a fan of; don't even know what it is actually. The best-laid plans sometimes get put on the back burner due to 'time' constraints as we all know. I had planned to get this exhibition article up a week, or was it two, ago. I hope you read my exhibition reviews for artists Yoshida Yoshihiko and Toyofuku Makoto. Both those exhibits, plus this one for Matsuzaki, were all part of a recent weekend adventure in Tokyo. Well, here it is, after some time. An annual event is Mashiko-based Matsuzaki Ken's Keio Department Store Exhibition. 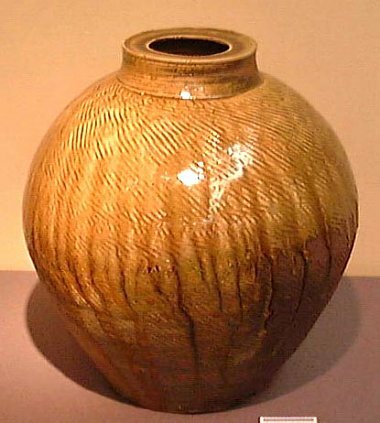 It's something I always look forward to for not many potters show the variety and number of works in one show as Matsuzaki does. I guess he had close to two hundred pieces in this 24th showing! Walking onto a Tokyo department store floor is a bit overwhelming and it can easily take about ten minutes to find the gallery space. At last I found where I set out to be and saw Matsuzaki's works overflowing out of the gallery's entrance onto counters and glass cases (see below photo). These were mostly tableware and drinking vessels. 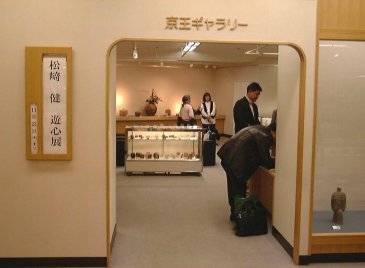 Walking into the gallery I was bedazzled by the forms and styles that Matsuzaki creates, so different than what one expects from a Mashiko potter. Yet Mashiko, like Seto, has lost its identity and it's sort of anything goes. 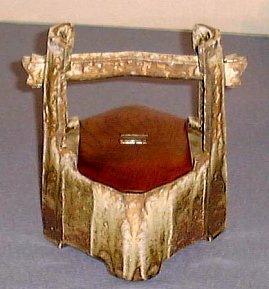 Matsuzaki keeps within traditional boundaries though and fires wonderful ash-glazed works, Shino, Oribe, and Setoguro. 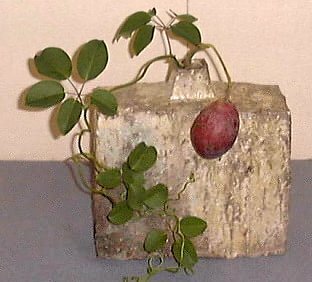 His square-shouldered jars with a petrified iridescent look were quite the sight; broad and full of strength they dominated the room along with a few larger tsubo. 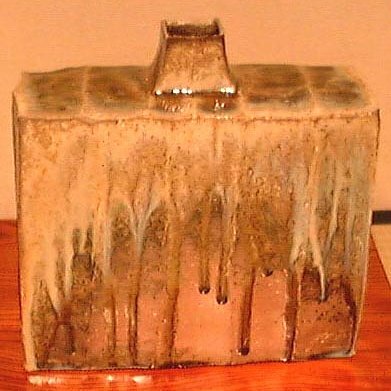 As did a few smaller forms like the handled buckets that were fresh waters jars (mizusashi). 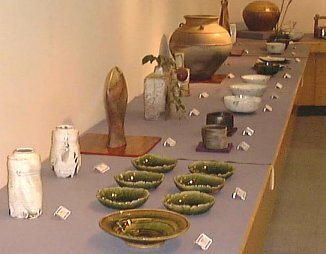 After taking in the Yoshida Yoshihiko chawan exhibition the day before, it would have been almost impossible for any potter's chawan to come close. 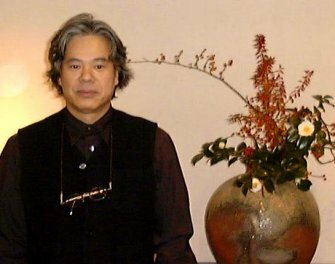 Both do Shino and while Yoshida's chawan offer quiet invitations to be held, Matsuzaki's chawan are more showy and vocal. 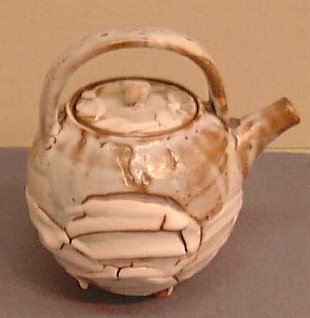 Some had frosting-like glazes (like this tea pot) that were quite delicious to look at. To hold they were a bit heavy and not as refined as Yoshida's. 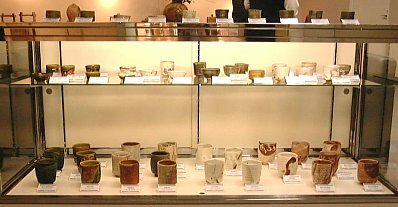 In the center of the room was a glass case full of guinomi, tokkuri, and yunomi. 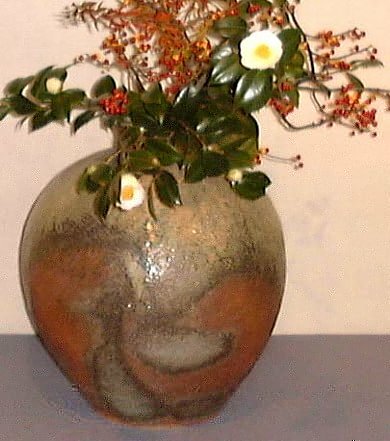 A particular hybrid Matsuzaki introduced was a white-slip hakeme under a deep Oribe glaze that worked quite well. I saw some chawan in that style as well. All in all another successful autumn exhibition for Matsuzaki. I happened to mosey over to the next gallery and found the works of Toyofuku Makoto, an associate professor of the Tokyo National University of Fine Arts and Music (Tokyo Geijutsu Daigaku).  Click here to continue with me on my gallery adventure.